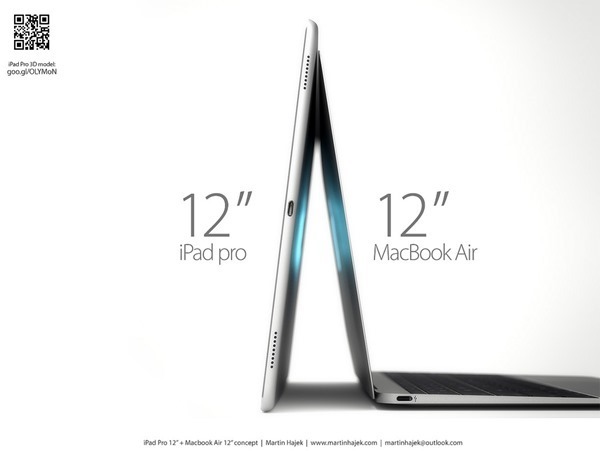 Looking forward to Apple revealing its 12-inch must-haves this year? 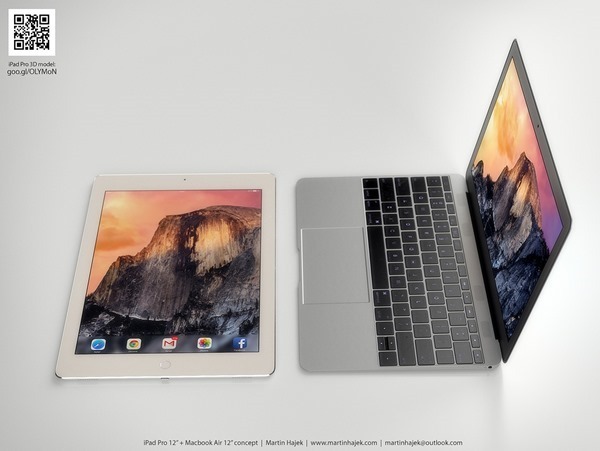 These iPad Air Plus and 12-inch MacBook Air concept renderings will help compare the two devices side by side, especially the size. Head on after the jump for further details. 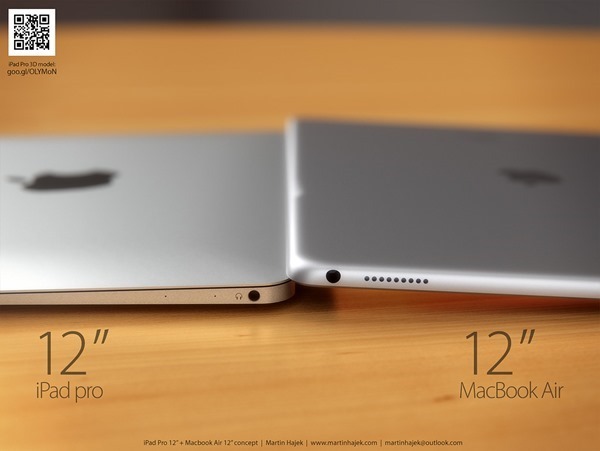 With Apple having foretold the arrival of the Apple Watch which is expected to be revealed this March, the iPad Air Plus or 12-inch MacBook Air’s arrival is still speculative at best, with fans still awaiting to see the devices in the flesh other than a few leaked images purportedly of the machines in question. 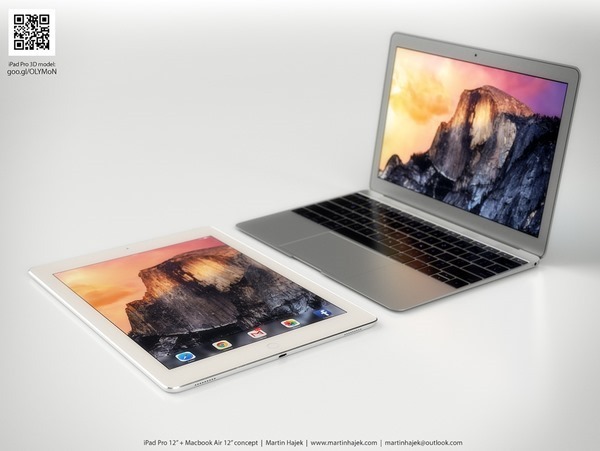 With some specs and dimensions being supposedly known via leaked bits of reports from various sources over a period of time, Martin Hajek has rendered his thoughts of the upcoming tablet and new notebook from Apple. 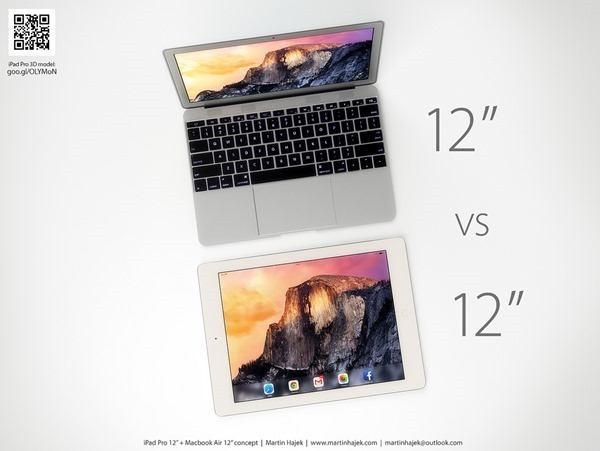 Hajek has done it before for the iPad Air 2 and the iPhone 6, and today marks the “Battle o thef 12 Inches”. 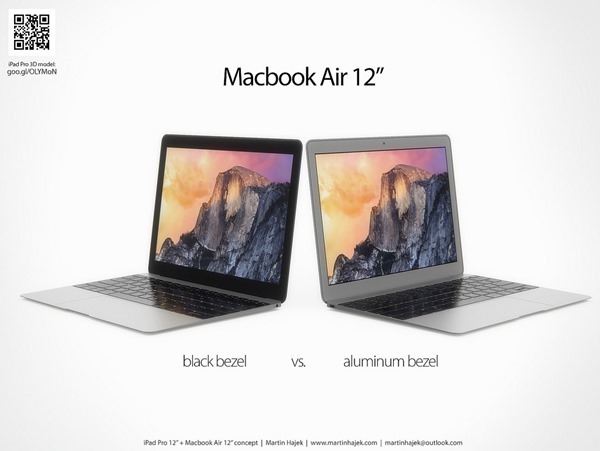 At a glance, the iPad Air Plus with its 12-inch display is as big as the 12-inch MacBook Air, which itself should be as big as a regular 11-inch MacBook Air given the smaller screen bezels. 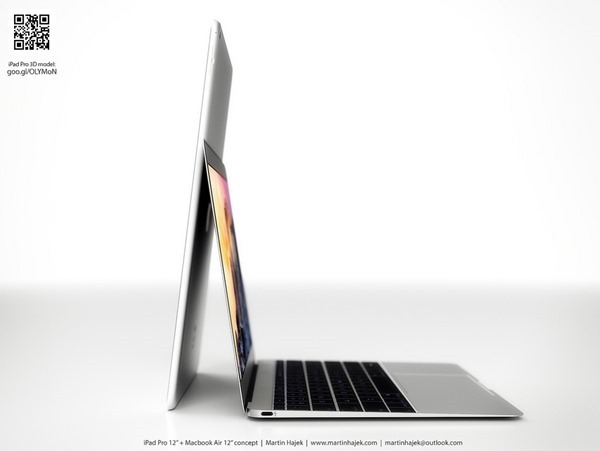 The new 12-inch MacBook Air is speculated to be the first thin notebook from Cupertino to offer a Retina display while further reducing on the thickness of the original. 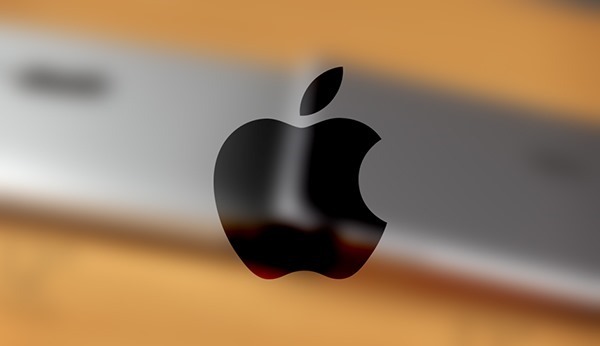 In the quest to achieving this, it has been rumored that Apple could be ditching the Lightning and USB ports for a single USB-C connector. 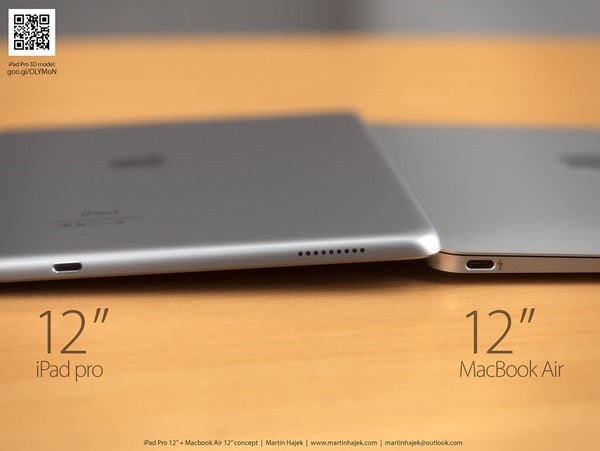 From the renderings, it looks like the iPad Air Plus is as thick as, or maybe thicker than, the 12-inch MacBook Air. 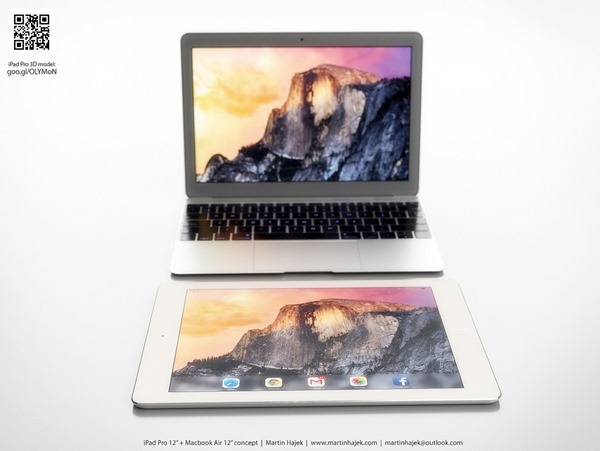 However the iPad Air Plus will supposedly be not just the largest tablet to be offered by the Cupertino based company, but considerably more powerful with a much improved A9 CPU to drive all those pixels and games. 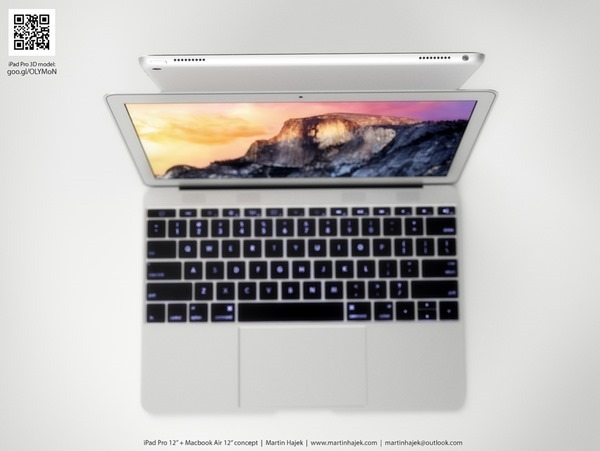 Hajek has also released renderings of two iterations of the new MacBook Air; one with a black bezel which is likely to have a piano gloss finish, and one with an aluminum bezel offering a bolder look. What’s your take on the concept renderings by Hajek? Let us know if you plan on grabbing one of these machines when released. Sound off in the comments section below. I’m generally of the belief that the word Pro being associated to an iPad w/o it running OSX would be a joke. There’s nothing Pro about it. Just a larger screen. Again more pointless posts from RP. Rumour this, concept that. Start reporting down real facts rather than more pie in the sky crap. iPhone 8 runour next is it. Yeah, RP, this is a RETARDED post. Wtf is the point of it?.. We know how an iPad looks and a MBA. So the “concept” illustrates these two devices resting one one-another, … wowwwww!… provides so much insight into the FUTURE. You bunch of dumbdumbs. For those planning to Jailbreak your new iPhone, iPad or iPod touch then I highly recommend adding this Cydia Source into Cydia after you jailbreak so you don’t have to manually input all those Cydia Sources manually. This will automatically add all the best Cydia Sources and give you access to all the best Cydia Tweaks, Themes and Apps for FREE with just a push of a button. Follow the steps below. This will give you all the best Cydia Sources to have access to all the best Tweaks, Apps and Themes for FREE.. So, you freely CHOOSE to click on an article that has the verbiage “[Concept Images]” in it’s title and then bash RP about it being retarded? 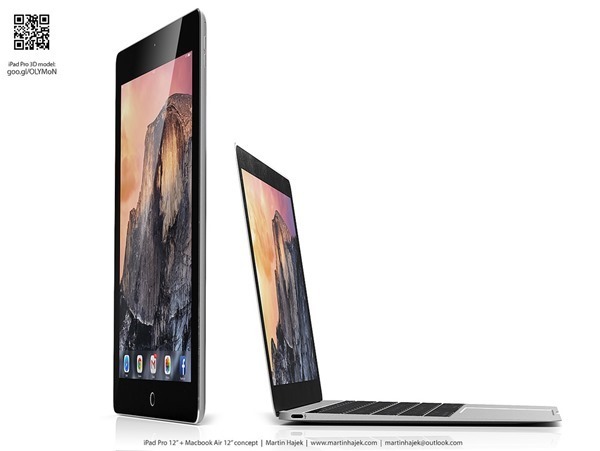 First, a 12″ iPad doesn’t exist, so how do you know how it looks?